The most successful article on The Book Chook in terms of traffic is How Do Kids Write a Book Review, which according to Blogger, has had 120 000 page views. 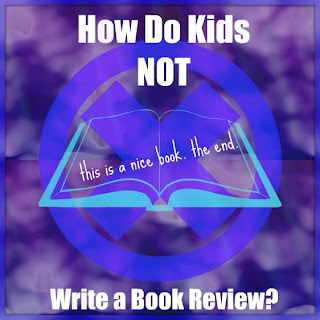 Because I'm aware that with some kids, we need to take a contrary approach, I thought I'd share some different kinds of book reviews I've seen. Sometimes, by working out what NOT to do, we can shape our learning towards a more successful technique. Besides, let's have fun with a subject that can strike fear into our very souls! Here are some book review examples you might like to use in a discussion with your kids. Discussion points could include why such a review might not work too well as a communication, whether kids can think of other unsuccessful approaches to writing book reviews, and finally, what better method would work for each child. Or you could have some fun writing more examples of unsuccessful book reviews. The short review: I liked it. The rude review: I would rather have my brain removed by flesh-eating zombies than read this book again. Use it to wrap your garbage. The my-teacher-made-me-do-it-but-I-haven't-read-the-book review: This is a very good book if you like that kind of thing and frankly I don't. But you should probably read it because it will make you smarter. There are 112 pages in the book. The cover is colourful. It's about a kid who falls down a hole. The short rude review: It sucked. The vague review: I liked the book because it was nice. The plagiarised review: Terror in the Marsh is a must-buy if your children enjoy a touch of horror in their fiction. I am an Amazon affiliate so please use the link to buy this book. The egotistical review: I, Matt, read this book and found it just okay. I could have written a much better book if I'd been bothered. I recommend this book to young kids and dumb kids. The cookie-cutter review: The title of this book is Horton Hears a What. The author of this book is D. R. Suess. This book is about Horton hears a what. I recommend this book for kids under 6. The spelling? what spelling? review: Wen you reed this book, you will need to have the lites on becarse its full of horrer. Of course, book reviews don't always need to be written. You might also like to read Alternatives to Book Reports with your kids. UPDATE: Thanks to Bethany from No Twiddle Twaddle, I found a Youtube video clip of Book Report from You're a Good Man, Charlie Brown. These are pretty horrible. Typical of what a child feels like when he is told that you must write a book report on everything that you read. No fun! Though some of these reviews as reviews are horrible, I just had to laugh out loud at some of them. Kids just speak their minds and I find it amusing. Love this post !! It brightened my day as well as your link to Alternatives to Book Reports. Thanks again Susan. I am 11 and when I was 7-9 that's just how I would do book reports I never liked them.. Sometimes writing is a chore! But when I write book reviews, I try to think of it as reaching out to as many kids and book buyers as I can with information about a book.